Material: Aluminium alloy /It is a walking/hiking aid , ideal for ever day use or on holidays. 4-level height adjustment from Approx 82- 92cm /32.3″ – 36.2″, Only about 10.3″ after folding. 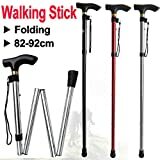 It is a walking/hiking aid , ideal for ever day use or on holidays. Easy to adjust, easy to fold, easy to carry & easy to store. It is sturdy yet lightweight.